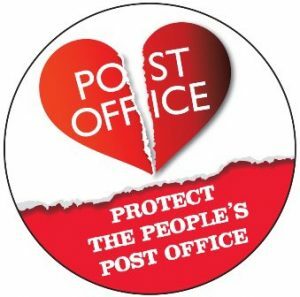 In the wake of an announcement by the Post Office of 600 job losses in its cash handling operation, Supply Chain, the CWU and Unite are calling for the Post Office management to resign in protest at the governmentâ€™s funding cuts to the service. The job losses announced today come on top of an expected loss of up to 500 frontline jobs from the franchising of thirty nine of its flagship Crown post offices and the loss of over fifty dedicated financial service experts selling products in branches through a further savings programme. The CWU and Unite believe the Post Office is in crisis and heading for extinction unless the government and company change course. Dave Ward, General Secretary of the CWU said, â€œwith this latest round of job losses, the management of the Post Office has to face the facts that it is in crisis and heading for ruin. If they care about the future of the network they should resign in protest at the straight-jacket government cuts have left them in. â€œThe Post Office was split from Royal Mail in 2012 in the run-up to privatisation and we are yet to see a plan that will secure its future. With a cut in its funding from Â£210m in 2013, to zero in 2019, these job losses show that under Sajid Javidâ€™s leadership the Post Office is heading the same way as the steel industry. â€œThis year alone CWU members in the Post Office face 500 frontline job losses in branches, 500 job losses in its cash handling business Supply Chain and the closure of their pension scheme. There is a perfect storm in the Post Office and our members will expect us to act to defend them. Brian Scott, Unite Officer for the Post Office, said â€œthe redundancies of 79 Unite members announced today, take the total number of proposed job losses to 130 in the last two weeks. These proposals tear the heart out of the Post Office and put it on the road to destruction. â€œThe Post Officeâ€™s business plan, which was agreed with the government, has failed. Those at the top should accept the blame for that â€“ but instead they are adopting a slash and burn approach in an effort to cover this up. â€œWe will not sit back and watch them destroy a public institution. Both the CWU and Unite are now calling for the government and the Post Office to halt the programme of cuts and to sit down with unions, customers, small businesses and communities who rely on it, to put together a fresh strategy that can develop new services and safeguard it for the future. The Post Officeâ€™s cash handling operation, Supply Chain, provides collection, handling and distribution of cash across the post office network (11,500 post offices) and forÂ external customers. The Post Office briefed staff about the job losses in Supply Chain this morning. The Post Office is also currently in the process of franchising 39, and closing 3, of its Crown Post Office branches which are directly operated by the Post Office. This is likely to mean up to 500 frontline staff leaving the Post Office in the coming months. Alongside this, the Post Office is consulting on a proposal to close its defined benefit pension scheme which will mean around 3,500 employees seeing a significant reduction in their pension entitlement. The CWU (the Communication Workers Union) is the recognised union for non-management grades, and Unite is the recognised union for managerial grades, in the Post Office.